I have always enjoyed at least one spin per Disney park visit on the classic Mr. Toad's Wild Ride. 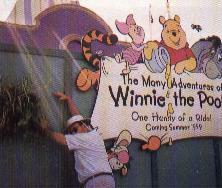 Alas, in the Florida park, the ride has been removed, soon to be replaced by dear Winnie the Pooh and his friends. This photo (right) was taken as I stood in mourning against the fence surrounding the former ride. When I got the film developed and noticed the sunbeams streaming over my shoulders, I realized it was all going to be okay. I recalled Walt Disney's claim that Disneyland would never be finished. All of the parks will grow, change, and improve over the years. Was the sunbeam a trick of the lens, or was Walt reassuring one of his fans that we'll be able to forever ride a favorite ride one more time in our dreams? All content ©1999 Disney Magazine.